Follow these simple steps and that ideal property in Morocco will be yours. Before you fly out to Morocco, spend plenty of time researching the market online. Go through all of the information in the Moroccan section of this site and then start looking for developers, agents or individual properties that look as if they might be interesting. The Moroccan Listings section of the site is probably the best place to start your search, but also check out the advertising in this section, and look at the Directory to get some more contacts. Although it is possible to arrange financing in Morocco through a Moroccan bank, it is not as easy as in many of the other markets that we cover on Propertastic! and the terms aren’t so great either. As a result, you will probably find it a lot easier to obtain financing in your home country, perhaps by re-mortgaging your current property or properties. Another option is to discuss the possibilities with a mortgage broker who is based in your home country and has experience of arranging mortgages on property overseas. It is advisable to do this before heading out to Morocco so that you have a firm idea as to what your maximum budget is going to be. If you spend all your time over there looking at properties around EUR150,000 and then come back and find that the maximum amount you are able to finance is EUR100,000, your time will have been wasted. Use the Budget Flights Tool to work out the most affordable way of getting to Morocco and then head out there to look at those properties that look most interesting for you. Check the properties, or the locations if you are looking at an off-plan property. Don’t just check the properties themselves; check out the areas that they are located in as they will all be new to you. Ask plenty of questions. Although in most of the territories we cover on Propertastic! 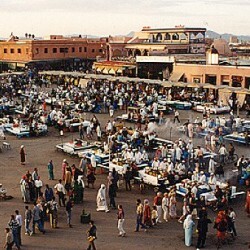 it is quite possible to avoid real estate agents by going direct to property owners, this is not advisable in Morocco. It is much safer to work together with a local real estate agent (simsaar). Although their services will typically cost you 2.5% of the purchase price, you’ll probably save a lot more than this than if you were to try and deal direct, as sellers can quite often put prices up as soon as a ‘rich foreigner’ begins to start showing interest in it. Note that most simsaars speak very little English and often not much French either, so you may very well have to hire a translator as well in order to communicate with them. If you are going to be buying an off-plan or a newly built property that has not been occupied in the past, you might be able to get away without employing a lawyer providing that you have someone else to help you through the process. However, if the property has been occupied in the past, then you definitely need to employ the services of a qualified lawyer or else you are definitely in dire danger of running into some major problems further down the line. This is because, unlike in most territories that we cover, there is no Land Registry which lists ownership details of all property in the country, meaning that it can be difficult in many cases to ascertain exactly who owns the property. As it is vital that you find a lawyer who is representing your interests and your interests alone, don’t ask the real estate agent or developer to recommend one – it’s better to choose one yourself. You can find details of Moroccan Lawyers in the directory section. One other advantage of using a lawyer is that, by giving them ‘Power of Attorney’, they will be able to sign legal documents on your behalf. This can offset some of the costs if it means your having to make one less trip to the Morocco in order to complete the buying process. If you do decide to employ the services of a lawyer, reckon on paying around 1% of the purchase price to them. Everyone know that, if you go to a market in Morocco, you never accept the first price you are offered for that carpet or amusing hat – you are expected to haggle and the initial price will reflect this. The prices of property in Morocco varies a great deal and so be prepared to do some haggling of your own, or get your simsaar to do it for you, before you come up with a final selling price that is acceptable to both you and the seller. Make sure you know exactly what costs are covered in the final selling price to avoid any nasty surprises further down the line. Another important point to discuss at this stage is exactly when the current occupiers are going to move out. It is not automatic that the occupiers move out immediately that the final contract is signed, so make sure that this is all agreed in advance to avoid any problems further down the line. There have been instances of buyers having to spend five years going through the archaic Moroccan legal system in order to evict previous occupiers before finally being able to access their own property. If you haven’t already arranged financing in your home country, you need to arrange it locally. If you’re going to be buying off-plan, then check with the developers to see if they can recommend a local bank. If not, you’re on your own. Check out the links to Moroccan Banks in the directory section. The process of obtaining a mortgage in Morocco from a bank is going to be similar to that in your home country. They are going to see some proof of income before committing to a loan, so make sure that you bring all of your important documents with you to a meeting with a bank. Expect to have to wait for a minimum of a week or two in order to get a final decision from the bank, perhaps longer. This will need to be signed in front of a notary (notaire). Typically, your lawyer will have several weeks to check the Title Deeds if any exist for the property. If there are none, and the property is not listed with the Land Registry it is known as ‘melk’ and is governed by Muslim law, which means that your lawyer will need to search the legality of the property and the owner’s rights to sell it in depth before you are even able to get to the stage of making an initial contract. Despite the seemingly chaotic nature of the property registry situation, lawyers are sometimes able to check ownership in a very short period of time compared to many territories, however – often in a matter of days, although a period of six to eight weeks is more typical, so make sure that this is sufficient time for you to have all of your funds in place to complete the purchase because, if you aren’t ready to complete the purchase on the contracted date, you could very easily lose your deposit. Immediately that the agreement is signed, the buyer will pay a deposit (arbon), usually around 10-30%, to the seller. Unfortunately, you can’t really relax once you have paid the deposit, safe in the knowledge that your Moroccan dream property has been secured for you. The expression, ‘my word is my bond’ is not known in Morocco and it can often happen that the seller will carry on searching for another buyer who is willing to offer a higher price for the property, refunding the deposit to the original buyer if he manages to find one. While your lawyer is checking the status of the property, you will now have a certain amount of time to inspect the property. It is not so common in Morocco to request for a surveyor to make a full structural report on a property. If the property has been built recently, then a survey should not be necessary as the building will be under guarantee from the builders. Check the property out yourself. Chances are that it will be OK, but if you see anything that could cause you sleepless nights, then perhaps it is worth the money to get the property checked out first. Budget on spending around EUR250 for a thorough surveyor’s report on a property. You can find details of Moroccan Surveyors in the directory section. The final contract is signed once your lawyer has carried out all of the necessary checks and searches by checking the Title Deed or ascertaining ownership and the property’s legality through ‘melk’ and the seller has provided all of the relevant title documents and permissions for use. It is also advisable to inspect the property once again prior to signing the final contract to ensure that the occupier really has vacated the property. To complete the purchase, the buyer of the property needs to pay ‘Droit d’enstrigement’ (equivalent to Stamp Duty) equal to 2.5% of the property’s value, plus an additional 1% registration fee to the notary for their services. For such older properties with no title deeds, the notary is able to create and register deeds for an additional fee in the region of 1% of the property’s total value. Once these sums have been paid, you will be registered as the new owner of the property. Congratulations! You’ve just bought yourself a property in Morocco! That wasn’t so difficult now, was it? !